For the disaster relief operations of Second Harvest Asia/Food Bank Philippines, Taiwan Red Cross/Taichung Food Bank, other groups in Taiwan (Shen-Gang(Kamioka) Food Bank Distribution center, 台中市農會, Ya-Shin Charity) and Second Harvest Japan sent containers of food and goods to the Philippines. 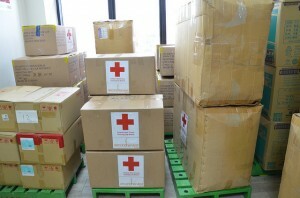 Taiwan Red Cross/Taichung Food Bank was quick to coordinate collection of goods and ship containers through LBC Express, a Philippine international logistics company. When 2HA’s Yusuke Wada visited Taichung Food Bank in October, he learned that Taiwan sent rice to the places that need it in case of disaster, but he never expected that Taichung Food Bank would take action so quickly to send rice and other goods to the Philippines. 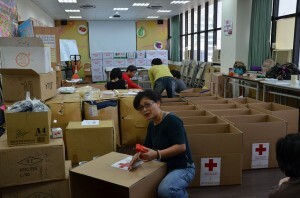 A volunteer preparing boxes for supplies at Taiwan Red Cross Taichung branch. This time, from Taiwan, thanks to the coordination by Jeff Chen, Taiwan Red Cross/Taichung Food Bank President, two shipments are on their way to the Philippines right now. The first shipment had more than three tons of rice plus other types of food items. The second shipment had another three tons of rice plus other food items. We thank people in Taiwan for their continuous help!! From Japan, Second Harvest Japan (2HJ) sent out a container full of food and supplies that are worth of US$260,000 in total. 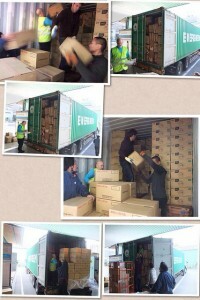 Among the goods, there were 400 cases of food Kellogg Japan kindly donated to 2HJ. 2HJ is planning to ship more containers on Dec. 4 and 11. If you are based in Japan and want to send aid goods to the Philippines through 2HJ, please contact 2HJ at charles@2hj.org. Staff members and volunteers of 2HJ load the container in Tokyo. This container was shipped to the Philippines on Nov. 29 and will arrive at Cebu on Dec. 13. We are very much grateful to all the supporters, food bankers, and volunteers who made this possible. We will post updates once our members in the disaster areas receive goods and distribute them to those in most need now.